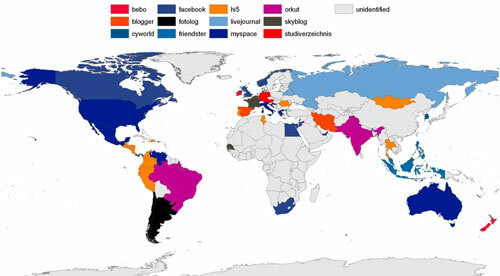 Above is a map of social networking sites and their reach across the globe. It’s interesting on a number of levels, but the one that stood out to me was the vast amount of opportunity staring at me from Africa. Outside of a handful of countries, no one has made much of an inroad on social networking in Africa. My claim is that this is due to two things. First, that no one with real capital is focusing on Africa. Second, that most of the efforts in the social networking space revolve primarily around the web accessed by PC, not the web accessed by mobile phones. Don’t forget sites like Bwanji.com that cater to Zambians and people with an interest in Zambia. Almost everyone probably knows it’s a steep hill to try and launch a social site that will compete with the likes of Facebook and MySpace, but catering to a targeted market can help jump start a social site. When talking of medium of delivery, one probably has to evaluate the cost of development when targeting clients accessing the site on a PC vs. those on a mobile device. Lastly, a lot of social site startups in Africa, want to have first mover advantage and thus resort to prepackaged scripts or solutions (e.g. PHPfox, Boonex, Izabi …) that will provide basic social networking features in the shortest timeframe possible. This limits innovation since your feature set is at the mercy of the development roadmap of the prepackaged solution. John’s hits the bullseye with his comment. As much as I appreciate the power of mobile phones in Africa, the cost of airtime is one issue that has , and will continue to limit their usefulness as “the African PC”. Competition from the more established social networks is very stiff. Hi5 alone has a very large population of Kenyans which is not reflected in the above statistics – in fact so many that at one point it was quite common to find a Kenyans profile photo featured on the front page. I’d conducted a survey to find out how feasible an exclusively African social network would be and the results were a bit surprising. A lot of people actually believed Hi5 was African! What I realized was that people had built networks within Hi5 that would make it seem (to the user) that every profile they viewed was African. In other words, a sub-universe had been created within the universe of Hi5. John is right – prepackaged solutions like PHPfox, Boonex and Izabi only provide a temporary solution… an almost cookie cutter way to jump into the fray. Ultimately quite a bit of development will be required to build niche sites like ‘LinkedIn’ as I mentioned above. There are mini-successes such as http://www.nairaland.com, a forum, with over 100,000 signed members (not sure the percentage of active). True, I think there are lots of unnoticed users that aren’t shown in the above map (just as lots of users from Europe are registered with facebook & other US sites). Hmm… i know that Facebook has many networks for African countries. A freinds of mine just moved to Kigali and was shocked to find so many Facebook members in the Rwanda network once she switched over. I have been working on one for the last year or so but its getting investors to get it and understand the concept. Am still plugging away at it though and I think it will only be a matter of time. First of all, I appreciate the work done by those who cared to tabulate what and where, as far as social networking is concerned. Second, I think theres more to the story than the above conclusion of their research work. third: ” First, that no one with real capital is focusing on Africa” ..tell me why someone should focus on Africa if Africans are not focusing on themselves. I bet we would all be surprised to know how many Africans, in Africa are actually making up the number of all these social network groups. lastly: I kind of look at it in the positive perspective…..that Africa is still “unidentified”, as in we haven’t really showed what we are made of……if only we could get our acts together and explode in every hook and corner…. Fascinating Erik. In fact the whole site is. You’re doing something incredibly original here and for my money, this is what blogging’s all about. It seems to me that the survey that you link to is very focused on networking sites that are popular in the US. I note that for example my own country (sweden) has a “unidentified” leading social network. I can assure you that we have social networks here too. 😉 Might that be the case for some of the african countries as well? You’re right Buddy. The slant on this map is from very US-centric. However, from my experience monitoring the different social networks available in Africa, I can tell you that very few countries have their own social networks. I agree, mlevi.com was way ahead of itâ€™s time since it was custom built and curtailed to individual needs unlike mashada.com which uses third party software to deliver solutions. 2. They did not have the resources to continue to develop and maintain custom built software. A lot of startups today integrate 3rd party and open source software into their basic foundation in order to get started. Afrigator.com for instance is for the most part based on open source software… so I tend to disagree with you. Shoe string budgets tend to restrict the scope of what can and can’t be done. I hate to sound defensive, but ultimately time has unraveled what was to be. @Hash – You are right… very few African countries have their own social networks. My 2 cents on this is that the number of Africans online (in Africa) hasn’t yet hit the critical mass necessary to sustain the viral growth of a social network – its all in the numbers. The degrees of separation right now are so few that such a site would plateau too quickly. I say give it just a few years and we’ll go through our own boom (Web 3.0) where people actually get ridiculously wealthy doing this kind of thing.